Skoda Citigo Interior, Sat Nav, Dashboard | What Car? Entry-level S models miss out on height adjustment for the driver's seat, but all other trims get this feature as standard, making it easier for anyone particularly tall or short to get comfortable. The seat is easy to adjust too. As with nearly all city cars, the steering wheel only moves up and down (not in and out), so you might find it tricky to dial in the perfect driving position. Depending on your seating position, the steering wheel might obscure part of the speedo as well. The heating and ventilation controls are sensibly laid out and you don't have to stretch out to reach them. One mild annoyance is that versions with electric front windows don't have a driver's side switch for the passenger window. 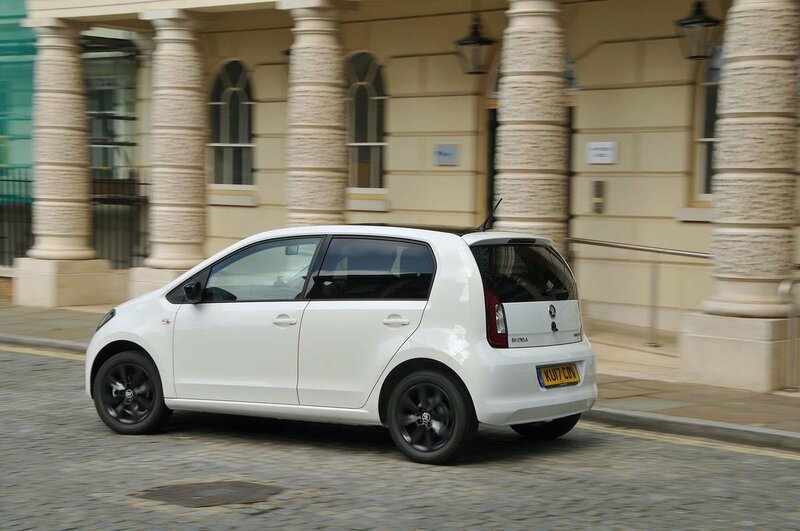 Forward and side visibility is excellent; the Citigo’s slender windscreen pillars don’t obstruct your view too badly and the tall side windows provide a good range of sight. Rear visibility isn’t quite so good, although the Citigo’s rear pillars are still narrower than those in many rivals and its rear screen isn't too poky. The car's boxy shape and short overhangs also make judging its extremities relatively easy. If you feel you need extra help when parking, you can add rear parking sensors to all models apart from the entry-level S. They come as standard with SE L trim. Entry-level S models get a relatively simple CD/radio system with two speakers. Disappointingly, Bluetooth isn't available as an option on this trim, although you do get a USB port, aux-in socket and an SD card slot. A DAB radio is a reasonably priced option on all trim levels. Upgrading to SE replaces the CD player with Bluetooth connectivity and four extra speakers for improved sound quality. It also provides a smartphone holder on the dashboard that, if you download Skoda's free Move & Fun app, gives you access to TomTom sat-nav directions and other handy features. While we like the fact that it means you don’t have to pay extra for sat-nav, we did find the system sluggish at times: its slow response made it tricky to navigate built-up areas with lots of junctions. Still, at least the handy holder makes your phone easily visible when you use any of your preferred map services. The graphics on the small infotainment screen are crisp and clear, and although it doesn't have many features, all the shortcut buttons are logically laid out. As tends to be the way with city cars, the Citigo’s interior features lots of hard plastics. However, the general construction is solid and the materials are textured in such a way that they don’t look or feel too cheap. 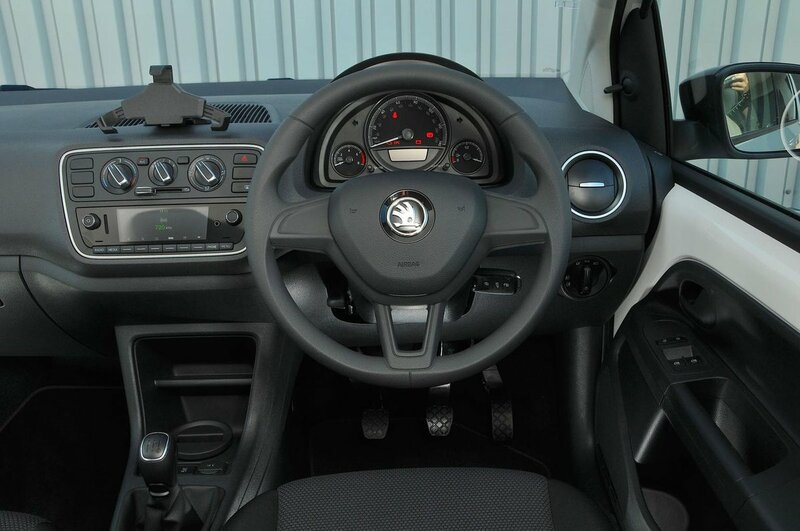 S and SE cars make do with a plastic steering wheel that emphasises the Citigo’s budget price a bit too much. However, you can pay extra to have a multi-function leather steering wheel on SE and Colour Edition – a luxurious touch that comes as standard on the higher trim levels. Monte Carlo versions get contrasting upholstery colours, chrome trim highlights and a gloss dashboard panel that helps to brighten up the interior.